Understanding the relationship between the structure, dynamics, and function of a protein is a central problem of modern protein chemistry and physics. Heme proteins in general, and myoglobin (Mb) and hemoglobin in particular, are used very intensively to study function-related conformational transitions of proteins. Their conformations, which are easily changed by binding or dissociation of different ligands, can be studied by virtually any kind of spectroscopy. Different techniques have been used to study the kinetics of the conformational transitions over very wide temporal and temperature ranges. 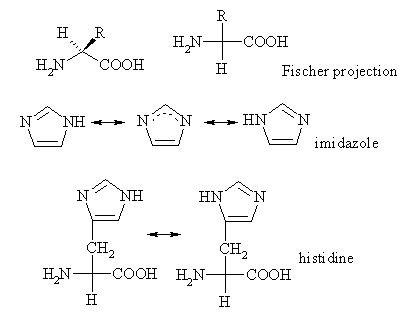 The iron-histidine (Fe-His) bond is the only covalent bond between the heme and the protein, which is affected by changes in protein structure and dynamics. Therefore the resonance Raman (RR) band corresponding to the Fe-His vibration with frequency ohm provides rich information on the state of both the heme and the protein (for review see Bangcharoenpaurpong et al., 1984; Kitagawa, 1988; and Rousseau and Friedman, 1988). Consequently, elucidation of the dependence of intensity, position, and shape of this band on the structure and the dynamics of the heme is very important for a reliable interpretation of the spectra under consideration. A number of studies have revealed substantial temperature dependence of this band, both in proteins (Ondrias et al., 1983; Sassaroli et al., 1986; Rousseau and Friedman, 1988; Ahmed et al., 1991; Gilch et al., 1993, 1995, 1996) and in model compounds (Chaudhury et al., 1992): the band shifts to lower frequencies and broadens upon heating. Two mechanisms were proposed to interpret this temperature dependence. The first (Gilch et al., 1993, 1995, 1996) invokes an idea of temperature dependent equilibrium of several specific protein conformational substates (CS) (Frauenfelder et al., 1994). From this point of view, in the liquid solvent the temperature change affects the distribution of the system (horse heart Mb in glycerol/water solvent) over three taxonomic CSs with different individual scattering properties. This causes thermal broadening of the band and a shift of its maximum. Note that the authors also had to postulate an additional specific protein phase transition at T = 130 K.
An alternative interpretation by Rosenfeld and Stavrov (1994) and Bitler and Stavrov (1999) suggests that the Fe-His band temperature dependence stems mainly from intraheme interactions and not from protein distribution over taxonomic conformational substates. On the basis of earlier studies (Bersuker et al., 1979; Bersuker and Stavrov, 1981, 1988; Stavrov, 1993; Stavrov and Kushkuley, 1993) Stavrov and coworkers concluded that there is a weak anharmonic coupling between the Fe-His and Fe-P displacements. Taking into account this anharmonic coupling and the effect of the glass transition, Bitler and Stavrov (1999) quantitatively interpreted the same experimental data (Gilch et al., 1995) using only one fitting parameter (constant of the anharmonic coupling) to describe the temperature dependence. The additional assumptions about a distribution of the system over taxonomic CSs and the presence of a specific protein transition were not invoked. Therefore it was concluded that these assumptions are superfluous. More recently the conclusion about the presence of the anharmonic coupling between the Fe-His and Fe-P displacements has been supported experimentally (Rosca et al., 2002) as well as theoretically using quantum chemical calculations (Franzen et al., 2002). Stavrov (2001) also showed that the anharmonic coupling under consideration contributes to the temperature dependence of the charge transfer optical absorption band III of deoxyheme proteins. Recently Schott et al. (2001) published a new study of the temperature dependence of "the resonance Raman spectra of the natural-abundance and of isotopically labeled ^sup 54^Fe heme of sperm whale Mb" (this article is noted as SDSS below). The authors obtained RR spectra with "an excellent signalto-noise ratio of ~46" at different temperatures, isolated the Fe-His band from these spectra and analyzed them. On the basis of this analysis they concluded that the band temperature dependence could not be explained only by taking into account the anharmonic coupling; therefore, an assumption about the temperature-dependent distribution of the system over five CSs was necessary. 1. It is "assumed that the v(Fe-His) linkage exists in multiple but distinguishable taxonomic conformational substates that are in thcrmodynamic equilibrium. They give rise to sublincs that constitute the v(Fe-His) band profile" (p. 1626). Using these assumptions, the authors fitted the temperature dependence of the isolated Fe-His band (Fig. 1 presents several of these bands) and obtained T^sub f^ [asymptotically =] 150 K and [Delta]T = 98 Â± 8 K.
However, it follows from Fig. 1 that the difference between the 50 and 100 K Fe-His bands (100 K much less than T^sub f^) is much greater than the difference between the almost overlapping 230 and 270 K bands (230 K much greater than T^sub f^. In short, the band of the glassy sample manifests stronger temperature dependence than that of the liquid sample. In general, such behavior in bandshape is very unusual. It also clearly contradicts the assumption that the bandshape is controlled only by the population of the conformational substates, which in turn are in thermodynamic equilibrium above T^sub f^ and are frozen in below T^sub f^. Despite this contradiction the authors used Eq. 1 to describe the temperature dependence of the Fe-His band obtaining [Delta]T [asymptotically =] 100 K. This result is much larger than [Delta]T [asymptotically =] 10-20 K, which was obtained in other studies of protein dynamics in a glycerol/water solvent (see, for example, Demmel et al., 1997, Kaposi et al., 2001, and the corresponding SDSS references). It also follows from the magnitude of the width of the glass-liquid transition interval, that in the interval of temperatures under investigation the sample is in a transition state. An application of equations of equilibrium thermodynamics to a description of a transition region (even using T^sub eff^) seems questionable. Even if such a description makes sense, it critically depends on the explicit shape of the relationship between T^sub eff^ and T. From this point of view the use of Eq. 1, rather than some other expression, seems unfounded. The analysis presented above shows that despite the successful fit of the experimental data, the SDSS interpretation leads to contradictions. Our attempt to lit the SDSS isolated Fe-His bands using the anharmonic coupling approach also failed. Therefore we decided to check the SDSS procedure of the Fe-His isolation, which is based on the spectra deconvolution and which, like any deconvolution procedure, can be ambiguous. To do this Korostishevsky and Stavrov (2003) developed a mathematical procedure for isolating a wide band from a complicated vibrational spectrum without making any preliminary assumptions about its shape. This procedure uses the difference between the spectra of naturally abundant and isotopically substituted samples as the input. This is feasible when the isotopic shift is significantly smaller than the bandwidth, and also guarantees high signal-to-noise ratio of the isolated band if the original vibrational spectra are of high quality. Using this method Korostishevsky and Stavrov (2003) isolated the Fe-His band from the resonance Raman spectra of the sperm whale deoxymyoglobin ^sup 56^Fe and ^sub 54^Fe samples (Hirota et al., 2002) (see Fig. 3). It was successfully fitted to the anharmonic coupling model (Rosenfeld and Stavrov, 1994; Bitler and Stavrov, 1999), the fitting parameters being close to those obtained earlier (Bitler and Stavrov, 1999). The difference between this band and the SDSS band is much greater than the noise contribution (Korostishevsky and Stavrov, 2003); compared to our result, the SDSS band has a pronounced high-frequency shoulder, whereas the low-frequency tail is totally absent. Note that the conditions of the experiments by Hirota et al. (2002) and Schott et al. (2001) were not identical. First, the experimental temperatures were slightly different, 293 and 270 K, respectively. However, in the framework of the SDSS approach, this temperature difference is not expected to influence the bandshape, because the band is hardly affected by heating from 230 to 270 K (see Fig. 1). Second, Hirota et al. (2002) used water solvent, whereas Schott et al. (2001) used glycerol/water mixture. In principle, according to the SDSS interpretation, the solvent may affect the protein dynamics and, consequently, the Fe-His bandshape. Nevertheless, taking into account that both the samples were liquid, it seems highly unlikely that substitution of water for the water/glycerol mixture could affect the protein distribution over CSs strongly enough to change the Fe-His bandshape so significantly. The difference between the two bands under discussion is probably caused by limitations of the SDSS isolation procedure, which also resulted in the very unusual temperature dependence of the isolated Fe-His band (see Fig. 1 and discussion above). Unfortunately we did not have an opportunity to isolate the Fe-His band from the SDSS experimental spectra, because the authors did not provide us with their data. Therefore the only way to check the SDSS isolation procedure was to compare the band isolated from the spectra obtained by Hirota et al. (2002) with that of the SDSS article. In conclusion we note that the final statement of the SDSS article that "results clearly prove the existence of taxonomic substates in the Fe2+-N^sub [epsilon]^(His^sup F8^) linkage in heme-proteins" is problematic. It would be very interesting to use our method to accurately isolate the Fe-His band from the high-quality experimental SDSS spectra. This would allow proper interpretation of the resonance Raman Fe-His band and elucidation of the protein dynamics. We thank Drs. S. Hirota and T. Kitagawa for providing us with the resonance Raman spectra of sperm whale deoxymyoglobin. Ahmed, A. M., B. F. Campbell, D. Caruso, M. R. Chance, M. D. Chavez, S. H. Courtney, J. M. Friedman, I. E. T. Iben, M. R. Ondrias, and M. Yang. 1991. Evidence for proximal control of ligand specificity in heme proteins: absorption and Raman studies of cryogenically trapped photoproducts of ligand bound myoglobins. Chem. Phys. 158:329-351. Bangcharoenpaurpong, O., K. T. Schomaker, and P. M. Champion. 1984. A resonance Raman investigation of myoglobin and hemoglobin. J. Am. Chem. Soc. 106:5688-5698. Bersuker, I. B., and S. S. Stavrov. 1981. Vibronic effects in geometry and stereochemistry of metalloporphyrins and hemoproteins. Chem. Phys. 54:331-340. Bersuker, I. B., and S. S. Stavrov. 1988. Structure and properties of metalloporphyrins and hemoproteins - the vibronic approach. Coord. Chem. Rev. 88:1-68. Bersuker, I. B., S. S. Stavrov, and B. G. Vekhler. 1979. Pseudo Jahn-Teller effect as a cause of the iron atom displacement from the heme group plane and possible source of trigger mechanism of conformational changes during oxygenation of hemoglobin. Biofizika. 24:413-418. Chaudhury, N. K., G. S. S. Saini, and L. Verma. 1992. Stereochemical aspects of axial ligation in ferrous iron-porphyrins probed by resonance Raman spectroscopy. Spectrochim. Acta. 48A: 1589-1599. Demmel, F., W. Doster, W. Petry, and A. Schulte. 1997. Vibrational frequency shifts as a probe of hydrogen bonds: thermal expansion and glass transition of myoglobin in mixed solvents. Eur: Riophys. J. Biophys. Lett. 26:327-335. Franzen, S., K. Fritsch, and S. H. Brewer. 2002. Experimental observation of anharmonic coupling of the heme- doming and iron-ligand out-of-plane vibrational modes confirmed by density functional theory. J. Phys. Chem. B. 106:11641-11646. Frauenfelder, H., G. U. Nienhaus, and R. D. Young. 1994. Relaxation and disorders in proteins. In: Disorder Effects on Relaxational Processes. R. Richert and A. Blumen, editors. Springer-Verlag, Berlin. 592-614. Gilch, H., W. Dreybrodt, and R. Schweitzer-Stenner. 1995. Thermal fluctuations between conformational substates of the Fe2+-N^sub [epsilon]^(His^sup F8^) linkage in deoxymyoglobin probed by the Raman active Fe-N^sub [epsilon]^(His^sup F8^) stretching vibration. Biophys. J. 69:214-227. Gilch, H., R. Schweitzer-Stenner, and W. Dreybrodt. 1993. Structural heterogeneity of the Fe2+-N^sub [epsilon]^(His^sup F8^) bond in various hemoglobin and myoglobin derivatives probed by the Raman active iron histidine stretching mode. Biophys. J. 65:1470-1485. Gilch, H., R. Schweitzer-Stenner, W. Dreybrodt, M. Leone, A. Cupane, and L. Cordone. 1996. Conformational substates of the Fe2+-N^sub [epsilon]^(His^sup F8^) linkage in deoxymyoglobin and hemoglobin probed in parallel by the Raman band of the Fe-His stretching vibration and the near infrared absorption band III. Int. J. Quantum Chem. 59:301-313. Hirota, S., Y. Mizoguchi, O. Yamauchi, and T. Kitagawa. 2002. Observation of an isotope-sensitive low-frequency Raman band specific to metmyoglobin. J. Biol Inorg. Chem. 7:217-221. Kaposi, A. D., J. M. Vanderkooi, W. W. Wright, J. Fidy, and S. S. Stavrov. 2001. Influence of static and dynamic disorder on the visible and infrared absorption spectra of carbonmonoxy horseradish peroxidase. Biopliys. J. 81:3472-3482. Kitagawa, T. 1988. The heme protein structure and the iron histidine stretching mode. In Biological Application of Raman Spectroscopy. T. G. Spiro, editor. Wiley & Sons, New York. 97-131. Korostishevsky, M., and S. S. Stavrov. 2003. Simple method for isolation of a wide band from a complicated vibrational spectrum. Vib. Spectrosc. 32:147-154. Ondrias, M. R., D. L. Rousseau, and S. R. Simon. 1983. Resonance Raman spectra of photodissociated carbonmonoxy hemoglobin and deoxy hemoglobin at 10 K. J. Biol. Chem. 258:5638-5642. Rosca, F., A. T. N. Kumar, D. Ionascu, X. Ye, A. A. Demidov, T. Sjodin, D. Wharton, D. Barrick, S. G. Sligar, T. Yonetani, and P. M. Champion. 2002. Investigations of anharmonic low-frequency oscillations in heme proteins. J. Phys. Chem. A. 106:3540-3552. Rosenfeld, Y. B., and S. S. Stavrov. 1994. Anharmonic coupling of soft modes and its influence on the shape of the iron-histidine resonance Raman band of heme-proteins. Chem. Phys. Lett. 229:457-464. Rousseau, D. L., and J. M. Friedman. 1988. Transient and cryogenic studies of photodissociated hemoglobin and myoglobin. In Biological Application of Raman Spectroscopy. T. G. Spiro, editor. Wiley & Sons, New York. 133-215. Sassaroli, M., S. Dasgupta, and D. L. Rousseau. 1986. Cryogenic stabilization of myoglobin photoproducts. J. Biol. Chem. 261:13704-13713. Schott, J., W. Dreybrodt, and R. Schweitzer-Stenner. 2001. The Fe^sup 2+^-His^sup F8^ Raman band shape of deoxymyoglobin reveals taxonomic conformational substates of the proximal linkage. Biophys. J. 81:1624-1631. Stavrov, S. S. 1993. The effect of iron displacement out of the porphyrin plane on the resonance Raman-spectra of heme-proteins and iron porphyrins. Biophys. J. 65:1942-1950. Stavrov, S. S. 2001. Optical absorption band III of deoxyheme proteins as a probe of their structure and dynamics. Chem. Phys. 271:145-154. Stavrov, S. S., and B. Kushkuley. 1993 Dependence of the iron-histidine frequency of deoxy heme proteins on the structure of its active center: quantum chemical study. In Fifth International Conference on the Spectroscopy of Biological Molecules. T. Theophanides, J. Anastassoupoulou, and N. Fotopoulos, editors. Dordrecht. Kluwer Academic Publishers, Norwell, MA. 305-306. Submitted April 17, 2003, and accepted for publication September 12, 2003. Address reprint requests to Solomon S. Stavrov, E-mail: stavrov@post.tau. ac.il.